World Chess Cup 2005, Khanty-Mansiysk, Russia. News: Boris Gelfand: It is too early to write us off! 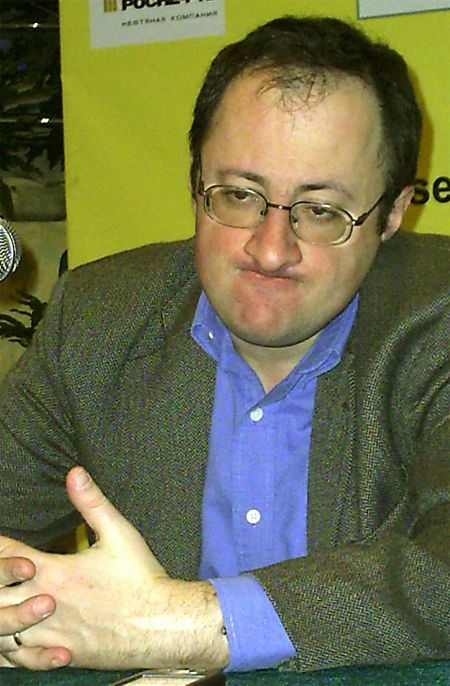 16.12.2005 Boris Gelfand: It is too early to write us off! Some 10 years ago he used to be considered one of the most successful chess players of his generation – Boris Gelfand has been a regular winner of interzonals, and played in the World Cham-pionship candidates matches. Now, in Khanty-Mansiysk, he has been one of very few players of older generation (couldn’t find a better term), who made an effort to stop the attack of 20-year old Grandmasters, occupying top places of the World Chess Cup pedestal. –What plans did you have before the start of the tournament? What were your aspirations? BG: Before the start I thought that there would be 5-10 favourites, including me. But with such format, one cannot be sure until the very end. The minimum task that I had is to be in the first 10 and to win a place in the World Championship candidate tournament. Of course, I nurtured some ambitious plans. Unfortunately, I had to play a few tie-breaks in the early rounds, and accumulated some fatigue – as a result in the match against Grischuk I was not strong enough. BG: Why not? I have not realized myself in some games – it might be because of a long process of acclimatization. This is not a question of a form, rather the one of the opponents. They were not prominent but forceful. – Regarding the climate. It is your first time here, what do you think about the city and in general how is it to play here? BG: It is my first time here, the conditions are wonderful! I have only positive comments… Unfortunately, I have not had enough time to see the city. I hope during a free day I will be able to go for a walk in Khanty-Mansiysk. It is nice that such a high level tournament is being organized here. I am aware that a very strong tournament is organized in Poikovsky. Let’s hope that it will continue its existence. Very pleasant audience, it is a pleasure to play for them. – Would you please comment the key moments of your performance at this Cup? BG: In the first round it was an easy win over Kobese from South Africa. The second round, against a young Argentinean Felgaer, turned out to be stressful. The second game was the most interesting, where it was a complete chaos on the board, and my position was close to a victory, but… There was a rare paradox: any spectator, who could turn on his computer during the game, would have easily shown the way for the White to win, but when you are sitting at the board, it turned out to be too difficult a task. In the struggle for 5-8 places of course the motivation is not so strong – you are out of the quest for the Champion’s title. But nevertheless, I managed to concentrate and play the rest of the games worthily. –In this World Cup, whose play did you like most of all? –Do you realize that you also lack something in the knockout tournaments? BG: This something is called ''luck''. But when there are 10 real candidates for the victory, only one will be the lucky one. -And the luck is always somewhere near. BG: Yes, but you have to win her favors. I will continue to fight with my energy doubled, until the younger generation will sweep us completely from the chess board. –By the way, what is your opinion about the finalists? Don’t you have a feeling that younger players are gradually pushing aside those players who are over 30 years? BG: No, I don’t. Of course the first 4 at this World Cup – are the generation of 1983-84 – all of them are very strong guys, and mature outstanding chess players. But… last year I have played against all of them and did not lose a single game! My match with Grischuk was played on equal grounds, and I could have won. This year one of them, Aronian maybe, plays more successfully. If we speak about my generation players, then Ivanchuk continues to play brilliantly: he was not successful here, but he played fantastically in the first half of the year. I think it is too early to write us off. – I wonder that despite being a very strong generation, none of you has become Champion. BG: Kasparov has to be blamed for this, first of all. He was a super player and nobody could win against him! Anand, Ivanchuk have been taking 2nd and 3rd places… They might have been higher than me. But I have my share of big victories in the tournaments, I played in all World Championship cycles, and have been a candidate several times – played in a quarter and semifinals. I have nothing to complain about. It was just because Kasparov did not leave us any chances to get to the top. I think that our generation is one of the strongest in the chess history. There are cycles in every development: our generation was strong, then those who are 7-8 years younger than us… The next one again – in 7 years! There is logic in this: when you play against strong opponents since your childhood, you make fast progress. – What was your opinion about Kasparov’s decision to give up chess? BG: I think that chess has lost a lot after he left. As a person who loves chess, I have bitter feelings – there are very few people who are able to play such beautiful games that were played by Kasparov. In the mid 90-s he played, of course, stronger, than now. But of course his practical strength was still outstanding. I am glad that I had opportunities to play against such a player. Unfortunately, I did not win a single game, however a couple of times, I was one move far from the victory… This is his choice and we have to respect it. –Can you recall why you started to go in for chess? BG: Again, there is some ''fault'' of Kasparov here. The 1979 USSR Championship in Minsk has become a great impetus for my development as a chess player. I visited all the rounds, at this moment I was 11 years old. Of course, when children see strong Grandmasters from a short distance, and follow their games, it becomes a really incomparable impulse for their future development. BG: I have no bitter feelings about it, because there are many strong chess players in the world. In order to be permanently invited to Linares or Wijk-aan-Zee, you have to be in the top 5. Even if you are in the top 10, it does not guarantee the invitation. There are more strong players than strong tournaments. I am invited to play in Wijk-aan-Zee in January. I want very much to play there well. And in the period between these two tournaments I will be having rest and preparing. –You are the leader of the Israeli team. Aren’t you surprised that with such a team composition, you have not won any team competition, and playing at home was a disaster? –Please tell us about your coach. BG: It is my pleasure to introduce Alexander Khuzman. We have been working with him for about 15 years. He assists me in the top tournament, and I very grateful to him. I would like to note that he is very strong in practice as well: he has victories over Kasparov, Khalifman, Svidler, Adams… He has won over practically all strongest players of the world! –The same amount of years you work with Khuzman, the same time you always bring this magic bottle with you to the games. What is it so special you drink during the game? BG: There is no secret – this is usual water with vitamins, which can be found in any supermarket. BG: I don’t know, whether it helps or not. I need to drink something during the game, and it doesn’t harm me.